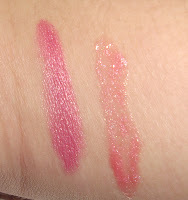 I was experimenting with these 2 new lip products that i received from a lovely company called "Glamorous Cosmetics"
I will be posting another post with all the products i did received and my first thoughts. after that in the coming weeks i will then gradually write reviews here on my blog and then end it with a full video review on my youtube channel. I was sent this product . It is my honest opinion. Pretty color. Lovely blog. Happy Holidays! I am using this Glamorous cosmetics product and this is my favourite shade in lip glose.